Beautiful 2/2 on the Atlantic Ocean with incomparable cleanliness and comfort! Hello and welcome to your Oceanside Oasis! Our family purchased this home with a few things in mind: a place for laughter, fun, memories, and relaxation. And it has done just that - and so much more. We hope that here, you create these very moments of your own! This 2 bed/2bath condo is on the TOP floor of the building with spectacular views. Begin your morning at sunrise with a cup of coffee in hand on a balcony overlooking the historical Florida Key mangroves and calming waves of the Atlantic Ocean, or unwind after a long summer day's adventures with a glass of wine and a memorable sunset. This home is self-managed, which means you will have the upmost cleanliness and attentiveness you require of the owners. The master bedroom is equipped with a large dresser and closet, fitted with extra blankets and sheets for your convenience. The master bathroom has a spacious walk-in shower to help rinse off all of the saltwater! The guest bedroom has a private entrance to the the guest bathroom providing convenience to those staying in this room. This bedroom is also fitted with a large dresser and closet for storage. The living room provides a comfortable gathering space for you and your family. With a large queen size, temper pedic foam pull-out sofa and love seat, families can get cozy for a fun movie and game night in! (And we have even provided some games and a dvd player to help with those nights spent indoors!). The kitchen is fully equipped with everything you will need to bbq, bake, cook, and everything else in between. From a double oven to a dishwasher, keurig/coffee machine to a waffle machine - you are completely covered. Of course, all dishware is also included! Beach towels, bath towels, beach chairs and toys, as well as basic kitchen condiments are included for your convenience. In unit washer/dryer also available. Should you have any questions please reach out, we are happy to hear from you! Plenty of activities in the area including: jet ski, parasailing, canoeing, kayaking, diving sites (like the world famous underwater Jesus Christ statue), boat rentals, fishing, and so much more!! Ocean Pointe Suites Marina slip rentals are reserved on a first come, first serve basis. 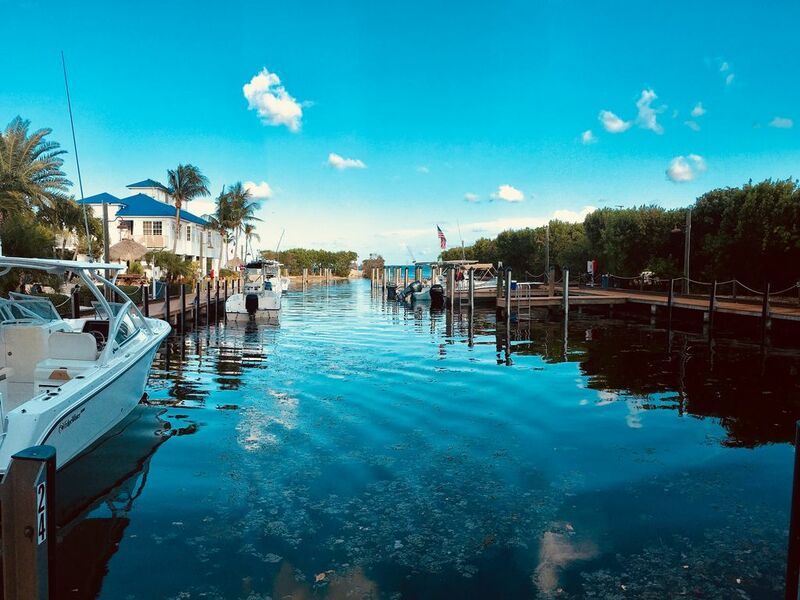 All boats are required to carry insurance Liability and as mandated by Ocean Pointe at Key Largo Condominium Association. Proof of insurance is required upon making reservations. Boats not carrying the minimum required coverage will not be allowed onto property. All jet powered watercraft (i.e. jet skis, jet boats, etc.) are strictly prohibited. Boats exceeding the registered length of 28 feet are strictly prohibited. Marina Facility Fee of $40.00 per night plus tax for boat parking and launch privileges. Holidays and Lobster Mini-Season will be an additional $15.00 per night over the base fee. Monthly stays are a flat $300.00 plus tax per month. This fee also allows for use of the boat washing stations. Wet slips are available at $3.00 per foot per night plus tax during Season (Mar 15 - Sept 15 & Dec 15 - Jan 15), $2.50 per foot per night plus tax during Off Season (Jan 16 - Mar 14 & Sept 16 - Dec 14), $4.00 per foot per night plus tax during holidays, Memorial Day Weekend, Fourth of July Weekend, and Labor Day Weekend and $5.00 per foot per night plus tax during Lobster Mini-Season. Prices may be subject to change, please confirm pricing when making reservation. My husband and I are both Miami natives, having lived and raised our two children here. My husband, Manny, grew up driving to and from the Florida Keys every weekend with his family. It is where he learned to boat, fish, snorkel, and dive. It was his dream to have a place for the family to go to on long weekends - and this year our wish finally came true!! We are so blessed to call this place home and look forward to sharing it with so many other families. The Florida Keys is a place like no other. Delicious and fresh sea food awaits at every corner - and the summer sun is unforgettable. The Keys begs for relaxation but also welcomes adventure, making it the perfect vacation spot. We specifically chose Tavenier because of its proximity to both Miami and Key West - making it an easy weekend trip to either locations (and all other locations in between!). Condo sits in view of the beautiful Atlantic Ocean. Queen size, temper-pedic pull out couch. Located in both bedrooms and in Living Room. Guests may bring boat for addtl fee, please see specifics in listing description. Please contact with any questions! This condo is in a large building of many units, and one of several buildings in the complex. The unit appears brand new inside and very nicely decorated. The bedrooms are nice size and each has a nice bathroom attached so privacy is as good as you could hope for a small unit. The kitchen, while compact, has pretty much everything you need to do your own cooking. Living room is cozy and a small balcony has room for two to enjoy the view and watch the critters in the field below. The large pool area for the complex is quite nice and better than I've seen in MANY hotels. Somehow we completely forgot to checkout the waterfront area until the morning we left, but that looked like a neat spot to check out. The location in Tavernier is great, being only blocks from stores, restaurants, gas, etc. I'd definitely stay here again, thanks! I was looking for a place a nice place near Islamorada . There were 4 of us. Saved money compared to a hotel. Beautiful well furnished condo in a gated community. Pool with a bar. Small private beach. It’s a winner. The property was just right! Having beach access and a nice gazebo overlooking the water was a great treat! The rooms were beautifully decorated and had nice amenities such as new rugs and nice dishware. The pool was large enough for all guests to enjoy. We biked to the park and to TavenierCreek. Lots to do and easy to relax. Added perk was watching the nesting osprey from the back deck. Our teens loved it! We so enjoyed our days in the Keys! Elizabeth and Manny were wonderful to work with and their rental is absolutely pristine! We were in Florida to celebrate my husbands 60th birthday... and that we did... They were very helpful with guiding us with things to do in the area and if we needed anything they were there for us! Ocean Pointe and it’s amenities are wonderful! The pool was so inviting and we had a day on the beach as well! We tarpon fished with a friend at night and the sky was so full of stars... when we were finished we were back to our cozy bed and quiet accommodations!!! We will definitely be back to see Elizabeth and Manny again!!! Great people and a great experience with VRBO once again! Great location, water front views. Not to far from things if needed. the property was amazing. very clean ! it had everything we needed. our stay was excellent. we loved the property. they have done a wonderful job with it. I only have one suggestion to anyone bringing their boat down for fishing. You have to send your boat info in ahead of time , and you do that with the office management. Manny will send you the info. But you have to do it well in advance of your stay. I didn't do this, and had to keep my boat at a marina down the street which was an added expense and an added inconvenience. but that was my fault for not reading the paper work carefully. I would definitely stay there again!! we loved it and had a great time.